The Priory Church of St Mary Magdalene is our parish church. It occupies what was the original nave of Lanercost Priory, an Augustinian monastery founded in 1169 and which has witnessed a wild and turbulent past. The Priory lies in North Cumbria, a stone's throw from Hadrian's Wall and set in beautiful countryside. It is at the heart of a small but vibrant rural community. This web site tells you a little of the story of Lanercost Priory, where to find us, and also tells you about its life today. Please take a few minutes to find out more about the Priory. Visit us - as well as visiting this web site we very much hope that we will be able to welcome you to the Priory itself, it is definitely worth a visit. 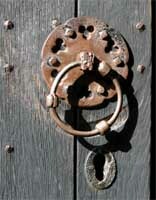 We are particularly pleased to welcome visitors of whatever denomination to our services. A centurial stone in the fabric shows that stone to build the Priory came from Hadrian's Wall. The Wall ran along the ridge overlooking the Priory. This stone is clearly visible, but was incorporated into the stonework upside down. The Priory Church is open every day of the year. There is no charge for admission but donations are gratefully received to help with the upkeep of this magnificant, historic building. The adjoining ruins are under the guardianship of English Heritage. Details of their opening times may be found at the following page. 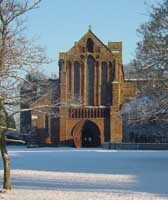 More about Lanercost - follow this link for details of books and publications about Lanercost Priory.